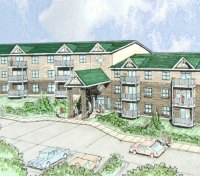 Bridgewater Terrace - An exciting well-appointed and spacious apartment complex right in the heart of Bridgewater. In our upscale spacious apartments, heating and air-conditioning is individually controlled from each apartment keeping you warm and cosy in winter and pleasantly cool in summer! And there is more... for those who enjoy an active lifestyle, and for those who would like to get fit, there is an exclusive, fully equipped exercise room. Only available to residents, this exercise room has the very latest "Vision Fitness" exercise equipment including treadmill, elliptical trainer, recumbent bicycle, three station Bodywork Bodycraft Multi Gym, and Swiss Ball exerciser... everything you need to get trim and stay that way.